Inspired by the Great British Sewing Bee 2015, I’ve been looking for men’s patterns. And I’ve been adding to this list when I find a new source. You might think there’s nothing for men learning to sew for themselves, between making a cushion cover and tailoring a suit, but in fact there are many options. Even the simplest modern sewing machine is a complex machine tool. (Here are links to information about the mechanisms.) And it’s surprising how many different techniques are involved in making even the simplest sewing project. Some people love challenges, some people prefer to learn one new technique at a time. There’s a subscription service for learning to sew mens’s clothes from complete beginner. Taught by Mimi G, Sew It Academy, about $12 a month – videos with few written instructions. If you prefer written instructions, here’s a “learn to sew” project book for complete beginners. The Merchant & Mills Sewing Book has a sequence of bags and home dec all suitable for both men and women (clothes patterns in this book are small and difficult to use, M&M single patterns are good). The Sewing Guru is a trained tailor who has videos for making shirts and suits (and pyjamas), using speed and classical tailoring techniques. Projects vary in difficulty, and there’s no formal sewing school with a suggested sequence for learning sewing skills. Burda Academy has an online video course for learning to sew menswear, which includes patterns for jacket, pants, and Barbour. This is also not for beginners. Pyjama pants with fly opening: Kwik Sew 3793. Elastic-waist pants, no fly opening : Kwik Sew 3345, Simplicity 2290. Elastic-waist cargo shorts with ‘mock fly’ (doesn’t open) : McCall’s 6933. 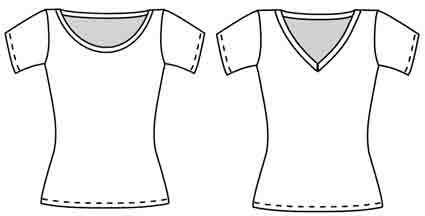 Tees with V and crew necks : Kwik Sew 3878. Jumpsuit costumes with zipper closure : McCall’s 7675. There is a shirt pattern labelled Learn to Sew by McCall’s, which is best avoided as it is definitely not easy, McCall’s 6972. For some reason they chose the most difficult way of attaching a collar. There are ‘learn to sew’ bag and home dec patterns at Kwik Sew Kwik Start which can be made in men’s fabrics. When you’ve learned the basics of how to sew, where can you go ? I haven’t linked to individual patterns here, as there are 100s of them ! These are just links to pattern sources. These are all paper patterns unless noted. Plus a final section on making your own patterns. There are about a dozen patterns for men in this list of patterns supposed to be sewable in less than 3 hours. Some of these sites are not sorted for men/women. Some are in several languages. Most of these only use a few basic measures, such as height, chest, waist, hips. Bootstrap Fashion has patterns for several shirts and jackets. Freesewing.org (formerly Make My Pattern) has patterns for most garment types. Lekala patterns include more than 120 patterns for men. For more detailed personalising of design and fit, see the ‘Make your own patterns’ section below. There is an on-line sewing magazine specifically for menswear, Bartack. This has been set up by Jamie Kemp, former contestant on the Great British Sewing Bee. Click on the Welcome to read about the content. It’s free to look at the content, subscription for the downloads. There’s an extensive pattern finder section. There’s the annual special family issues of Ottobre magazine, 7/2017, 07/2018, which have several traceable patterns for men. Many of the download patterns at Burda Style previously appeared in Burda Style pattern magazine. La Maison Victor is a Belgian pattern magazine said to have a pattern for men in each issue. Many of these sites aren’t pre-sorted for men/ women. There are several specialist pattern companies for historic styles. That doesn’t link you direct to the pattern. Here’s their list of links to sources. The Great Pattern Review site also has a ‘futuristic-fantasy’ section. For cosplay costumes for specific characters, you can usually find ideas on specialist sites for the character. There are some ‘online only’ cosplay costume patterns from McCall’s : Cosplay by McCall’s. Here’s a guide to tips on sewing outdoor gear which aren’t in most conventional sewing books. Many free patterns for bike bags available on-line. David Page Coffin, noted for his books and DVDs on shirts and pants, has video classes at Craftsy, David Page Coffin. Burda Academy have an on-line video course on making menswear, which includes download patterns for notched collar and barbour jackets, pants, no shirt. The Sewing Guru is a tailor who has many video courses on making shirts and suits. Kenneth King has video tailoring class at Taunton Workshops, Smart Tailoring. 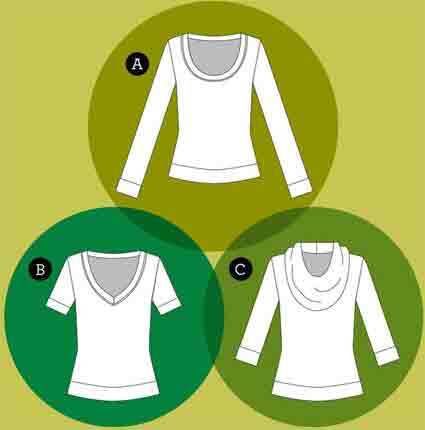 There are many video courses on making women’s shirts, which use the same techniques. Such as this class from Sew Over It, which includes both men’s and women’s shirts. The University of Fashion has on-line video lessons on drafting patterns for men. These are standard industry slopers. hoodie, shirt, pants, vest, jacket, coat. Don’t expect a perfect fit from these tools unless you’re lucky. They only cover about a quarter of all fitting issues. But they may give you a better fit than patterns for ‘average’ body shape. Shirts and casual jackets (easy to make any height-collar-chest combination up to about 157cm/62” chest). Pants for men instructions used with pants pattern (up to 62″ hips). There are many vintage pattern sites. Good places to start are searches on ebay and Etsy. The Japanese produce marvellous pattern books, with full size traceable pattern sheets. So long as you don’t mind they’re in Japanese ! with many good line drawings of construction. A fun challenge, but not for beginners. Sizes are small. Body sizes are given with the book information, in cm. Multi-size patterns, so they may be quite easy to grade up. These are the books for men’s clothes at my favourite source, which shows many sample pages. 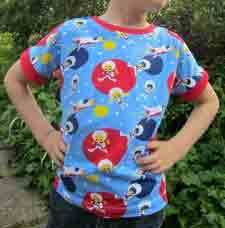 Free patterns – with very variable quality of pattern drafting and instructions. Sadly there’s no obvious good source focussed on men’s patterns. Men’s clothing may not show the almost infinite variations in style elements that there are in women’s clothes. The differences are more in subtle details. You do have to search thoroughly if you want something stylish, but there is a lifetime of possibilities to explore ! First written April 2015, links checked March 2019. I add a link whenever I come across a new source, but I don’t keep checking whether the links are all still valid. The second section of my list of sew-alongs for skirts. Sewalongs for people who like to watch rather than read what to do. Videos are on-line or on DVD. The first post in this group was about free on-line written skirt sewalongs with photos. If you prefer to learn by watching video demos, they’re not free. Sad, but producing these videos and DVDs does take a considerable investment in time and effort, so it’s understandable. And the videos often include much more complete guidance than the written ones. Most of these guides aren’t pattern specific, so I’ve just given example pictures. And as before – I haven’t seen most of these, so no guarantee of quality. . .
Free videos on their site about using a sewing machine. You need to be able to able to use a sewing machine, but otherwise for complete beginners. 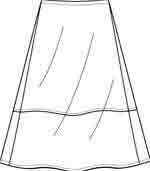 usually darts, zip, waistband, may be hem vent, lining. Most of these make a basic pencil skirt using any pattern, such as McCall’s 3830 classic tissue pattern. 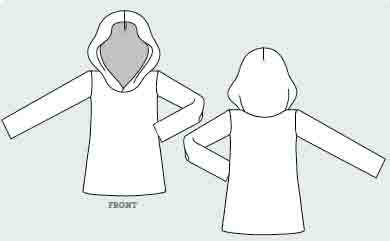 includes making a fitting muslin, and adding a lining. or the tissue pattern in her book Sew Everything Workshop. such as tissue pattern Butterick 5391. 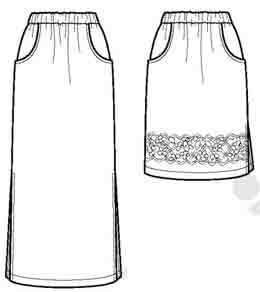 Use any pattern for skirt with waistband, darts, zip, hem slit, also pleats. YCMI DVDs are cumulative not stand-alone. Level 2 assumes you know the skills taught at Level 1 (elastic waist skirt). Craftsy class Design and make an a-line skirt, on-line class by Deborah Moebes. P. S. Here’s a free video for sewing an a-line skirt with box pleat, zip, waistband. it’s the free Wear Everywhere skirt from So Sew Easy. The written sewalongs for skirts (see my previous post) include a much wider range of style elements. Such as gathers, shirring, pockets, various waist treatments including shaped waistbands, faced waists, contour waists, and yokes. Goodness, there are so many skirt sew-along choices it’s a bit overwhelming. 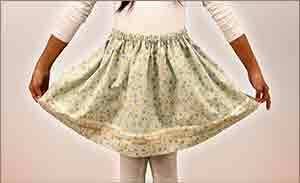 There are also huge numbers of free skirt patterns on the web. Many of them have primitive instructions, but once you have a few sewing skills there’s an enormous choice. So, first learn from the sewalongs, then you’ll be able to tackle those patterns. How to choose where to start ? What is your favourite support for guidance – reading or watching ? I confess I like both – video for being sure what is involved, written so I haven’t got to remember everything and can take it at my own pace. What is the right level of difficulty for you ? How many unfamiliar processes does each pattern include ? How many new processes are you happy to take on in one project ? I’m a slowly-but-surely learner, not one for jumping in to a challenge. Which style elements are most flattering to your waist-hip area ? Sadly, with my high hip pads and protruding stomach, only the smoothest pocket-free fit over the hips is a good idea on me. And I need to take care with where the waist sits – only a little below the waist is best. Can you alter the skirt length, for the most flattery to your length proportions ? your legs ? I’m short waisted, and high waists just look ridiculous. Knobbly knees are a family feature. And my ankles are not what they were. So it’s longer skirts for me. Imagine yourself wearing a style, or try on something similar in a store. Would you love to wear something like this ? I continue with my choice of a near-maxi 6-gore skirt. With darts, zip, narrow waistband, lining. Pencil skirt instructions include the sewing processes I need.